Over 55? Drive for Work? Beware! There's much to be said about older employees in the workplace: Their knowledge, skills, and experience often outpace that of their younger counterparts. When it comes to driving for work, employees 55 and older also get a gold star: They are statistically the most likely to adopt safe driving habits. However, despite being known for buckling up and adhering to posted speed limits, motor vehicle crashes account for more than one-third of workplace fatalities among workers 55 and older. Here’s another statistic to consider: Employees older than 55 are twice as likely to die in work-related vehicle crashes than their younger coworkers. 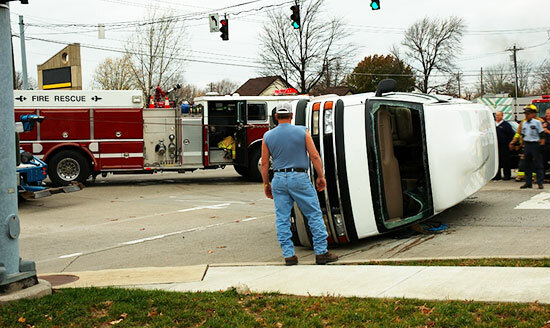 The injury attorneys at Edgar Snyder & Associates want to be sure those employees—as well as their employers—understand why these car crashes happen, and what can be done to prevent them. The main reason older employees may be more prone to work-related car accidents? The effects of aging. The Eyes—As people get older, their eyesight worsens, their peripheral vision declines, and they are more prone to eye ailments such as glaucoma and cataracts. The Ears—Age-related hearing loss can make it more difficult for workers to hear horns, vehicle safety alerts, and other noises. Motor Skills—When we get older, our motor skill functions decline—things like our strength, flexibility, coordination, and range of motion. Mental Ability—Some people experience a decline in mental function as they get older, which could impact everything from a person's attention span to their reaction time. Physical Wellness—Diseases and medical conditions can develop or become more severe with age. For example: Conditions like arthritis can cause stiff joints, which can impact a driver's reaction time. Chronic diseases that require pain medication may affect a worker's motor skills. While there is no fountain of youth—no way to stop the aging process—there are steps that employers and older employees can take to help curb the number of work-related motor-vehicle crashes among workers 55 and older. Requiring that seatbelts always be used. Monitoring speed through GPS or other programs. Providing flexible scheduling that helps prevent sleepy and night-time driving, when possible. Adopting zero-tolerance policies related to impaired driving and distracted driving. Implementing educational and training programs to help improve the driving skills of older workers. We want to stress that worker safety isn't just the responsibility of the employer—employees need to do their part, as well. Never drive while drowsy, distracted, or while under the influence of alcohol or drugs. Speaking of drugs: Be aware that even drugs that are prescribed by a doctor and taken as directed could impact a person's ability to drive safely. Talk to your doctor about how your medication may affect you. Visit the eye doctor at least once every two years to ensure your vision is on par. Take a driving self-assessment tool to determine whether you may need additional training. We hope you're never hurt while driving for work. But our workers' compensation attorneys understand that sometimes, no matter how many precautions you take, accidents can still happen. If you or someone you know was in a work-related car accident, we can help get you the money you deserve for your medical bills, time off work, and more. Call our experienced attorneys today. We'll answer your legal questions with no obligation to use our services. And like Edgar always says, there's never a fee unless we get money for you.